NDS4iOS has just started working and available today on iemulators.com. It’s very simple to install and get games so just follow the instructions here and the video below for steep by step walk through. First you will need to open safari on your iOS devices. I just want to add this DOES NOT REQUIRE A JAILBREAK. However, if you update to iOS 8.1 you will lose all emulator games including this awesome ds emulator here. Open safari and visit iemulators.com once open tap the “apps” category and scroll down until you see the nds4iOS option. Here you can find your favorite ROM game. I would suggest looking in Top 25 downloads first and go from there. Once you tap the game to download give it a couple minutes before doing anything else. Now you will need to get the screen to come up which allows you to “Open in” on the left side. After tapping “open in” choose the nds4iOS option from the share sheets. This will download your game INTO THE EMULATOR WE INSTALLED EARLIER. Once you have completed these steps the game will appear in the emulator when its ready to play. Simply tap the game name to load it and begin playing. The settings inside the emulator should be fine at default settings. 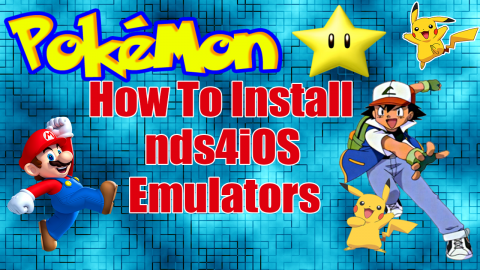 Watch us install the emulator in the video below. Please take a moment of your time to follow us on social media, Subscribe, and share this post. Be sure to check out our Playlist loaded with Free Cydia Tweaks for iOS 8.